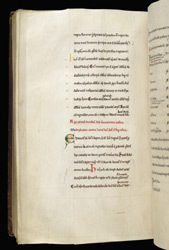 Almost nothing is known about Geoffrey of Ufford, and this appears to be the sole surviving copy of his compilation. The only clues are his name (there are two places called Ufford, both in East Anglia: one near Peterborough, the other near Woodbridge in Suffolk); one of the texts is a chronicle which ends with the coronation of King Henry II in 1154, and which gives emphasis to events relating to Thorney, Peterborough, Ramsey, etc.. Taken together, the evidence suggests that the work was composed in the area of Peterborough in or soon after 1154. This is a page of the Chronicle: a few lines above the rubric Thorney and Ramsey are mentioned.